Algerian triplets join Air Force for better future - The Maghreb Times ! For one Algerian family, 6,600 miles was the distance between a life of struggle, promise and opportunity. Their journey has carried them over thousands of miles, from a barren region in Africa to California’s Simi Valley where eventually the Harchaoui triplets — Myriam, Rabah and Warda — would join the U.S. Air Force. Scott Air Force Base is now home to Myriam, who recently reflected on her unique journey. Her mother, Brigit Wilcox, arrived in California at first with just the three boys in the family, leaving Myriam and her sister, Warda, in the care of grandparents. They were not able to come at the same time because the government only allowed the boys to leave, but when the girls reached age 5, they were able to join their family. When they arrived they didn’t know how to speak English and had to adjust to the different culture. Myriam said she was able to pick up the language quickly, and Warda, now an Airman assigned to the 60th Medical Operations Squadron at Travis AFB, California, said she learned the language through the Boys and Girls Club. Their brother, Rabah, who is an Airman assigned to the 56th Security Forces Squadron, at Luke AFB, Arizona, was age 2 when he moved so it’s all he’s really known. “Growing up here gave me a lot of opportunities and it has been a blessing so far,” he said. After graduating high school, the Harchaouis saw the Air Force as a good option because their older brother, Sofiane, had served six years as an F-16 avionics specialist. Additionally, the triplets were a part of their high school’s Junior ROTC, so they were introduced to the idea of the military early. 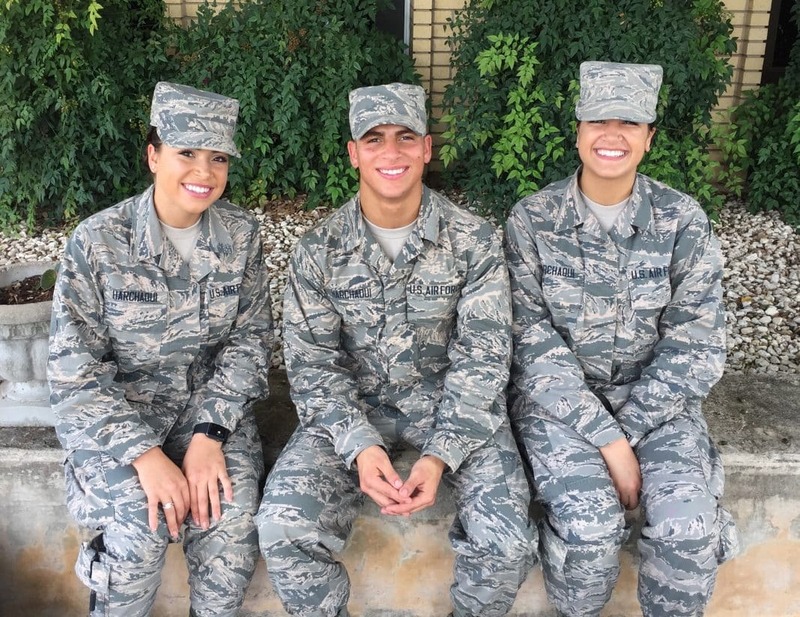 In 2016, they each raised their right hand in commitment to the Air Force, and they each had their own reason for doing so. Warda and Rabah said they saw the opportunities the military lifestyle offered. For Rabah, the military was a stepping stone for life after high school that could also provide college opportunities. Even with all of the benefits the military life has offered, Myriam said this has been the longest they have been apart since those early years, and it has been difficult for them and especially their mother. Still, she has remained very supportive of their decisions. The distance that comes with being members of the military has been tough on the family, but it has also helped strengthen the bond between them. The triplets stay in touch with each other through a group chat where they talk every day, said Myriam.